Come back starting April 18th to celebrate the 30th anniversary of the American Airlines AAdvantage program with a great new deal and a chance to win 30,000 AAdvantage miles every weekday. By the way, if you’re in the New York area on April 29, you can join May Leibman and Flyertalk founder, Randy Peterson for lunch and a round-table discussion at the The First Annual Randy Petersen Travel Executive Summit, sponsored by American Express. Go here for more details. 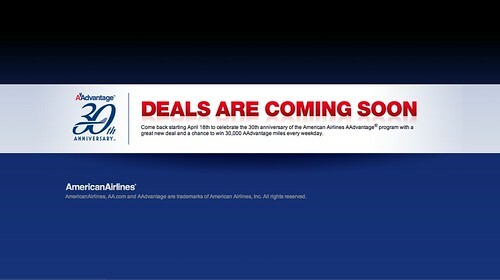 Offer: To thank AAdvantage members for 30 great years, we’ve lined up 30 incredible deals and a chance to win 30,000 miles every weekday from April 18th through May 27th.